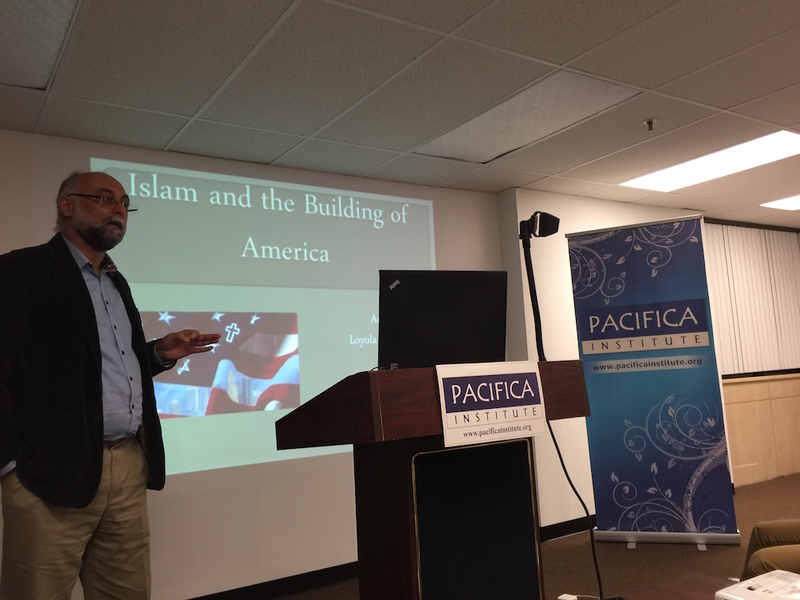 April 14, 2016, Amir Hussain, Professor of Theological Studies at Loyola Marymount University, gave a lecture on Islam and the building of America at Pacifica Institute Los Angeles branch. Dr. Hussain teaches courses on Islam and specializes in the study of contemporary Muslim societies in North America. Hussain is the author and editor of 5 books and over 50 scholarly articles and book chapters. 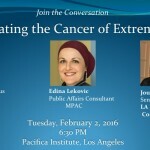 He is currently finishing a book on how American Muslims have woven themselves into the fabric of American life, titled, “Muslims and the Making of America.” From 2011 to 2015 he was the editor of the Journal of American Academy of Religion. 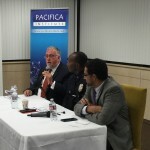 Hussain talks about the notion that Muslims are newcomers to America, which has a little bit of truth to it. The majority of self-identified Muslims are recent immigrants. However, there is a very important group, African-American Muslims, who were here before America was an independent country.About 10 percent of West African slaves were Muslims. Hussain’s recent book, “Muslims and the Making of America,” challenges the idea that Muslims are alien to American values and seeks to demonstrate that there has never been an America without Islam. Recently, when President Obama spoke about Muslims at the Cairo University, he said “They have fought in our wars, they have served in our government, they have stood for civil rights, they have started businesses, they have taught at our universities, they’ve excelled in our sports arenas, they’ve won Nobel Prizes, built our tallest building, and lit the Olympic Torch. And when the first Muslim-American was recently elected to Congress, he took the oath to defend our Constitution using the same Holy Quran that one of our Founding Fathers – Thomas Jefferson – kept in his personal library.” He had purchased the Quran in 1765, which eventually ended up in the Congress. 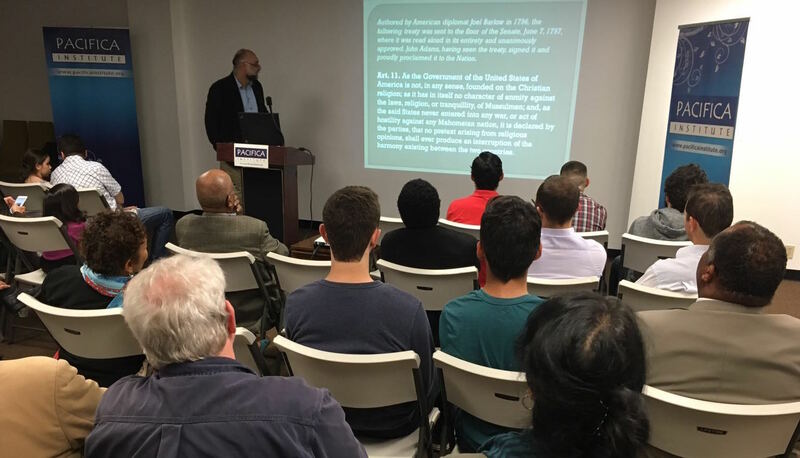 Hussain points out that Jefferson was definitely a fan of religious liberty and was quite proud of writing the Virginia Statute for Religious Freedom. Hussain mentions Muhammad Ali as his great hero and has dedicated his book to him and Ahmet Ertegun, a Turkish-American Muslim who co-founded Atlantic records. In the 1950’s, he had an influence on jazz music and signed many famous artists. In the 21stcentury, many Muslim rap and hip-hop artists spoke their faith through the lyrics of theirmusic. Hussain explains that Muslim influences on American music are evident just like many other aspects of the American culture. 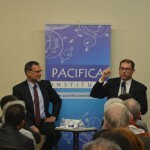 He concludes by restating that American values and Islamic values are intertwined and are not as different as imagined.